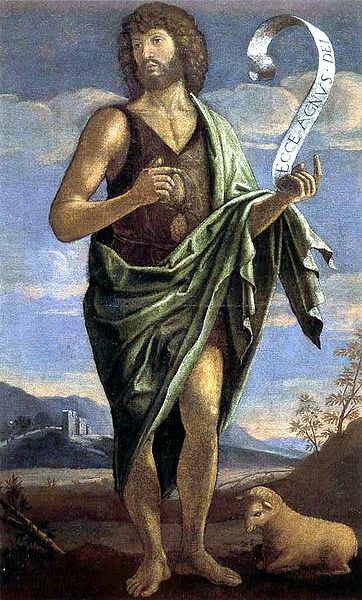 One of the most compelling characters of the Bible is John the Baptist. Unconventional and non-conformist, he speaks with unquestioned authority based on pure conviction. Baptism comes in many forms. When we moved our daughter into her dorm room, we found water from the HVAC vent dripping on her bed. I’ve been similarly baptized on NJ Transit buses in the summer when the condensation gathers just above my head. (Of course, being on the bus, I’m always hoping that it’s only water.) Considering how well HVAC contractors seem to be paid, it is always a wonder to me that little things like leaks can’t be sought and settled. Water always seeks the lowest point. In baptism a person is plunged even lower, beneath the water. It’s kind of like drowning. I was baptized in a river (or a creek that passed for a river in my part of Pennsylvania). Our church didn’t believe in infant baptism, so I was old enough to know that I was to be held under the surface for a second or two—a frightening prospect for a non-swimmer like me. It turned out alright, as these things generally do, and my ten-year-old sins were washed away to be somebody else’s problem further down stream. The origins of baptism are somewhat of a mystery. Many religions include purification rituals, including Judaism. Judaism, however, never seems to have taken ritual washing to the level demanded of John the Baptist. Even he had a rather tepid view compared to that of later Christians who made salvation without it impossible. It is perhaps the implicit admission of shame, or possibly the public spectacle of it all that makes it such a rite. Being rained on in the presence of a priest doesn’t count. Nor does, in some traditions, a mere trickle on the head. The victim must be cut off from the air above. Religion does insist on a fair bit of threat for believers as well as non. And so the water drips. Of course it’s a holiday weekend so they can’t get the maintenance guy to fix it until at least Tuesday. As we wait we know that the water will always continue to seek the lowest point. In these days of high technology, remembering childhood might be seen as cowardly nostalgia. When driving my daughter back to college, however, sometimes I need a little nostalgia. 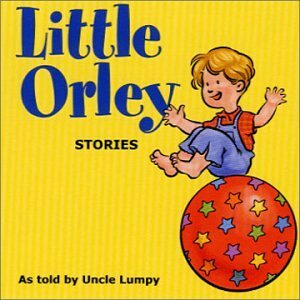 So it was that we passed a pleasant couple of hours listening to Little Orley stories told by Uncle Lumpy. Having read ancient history for years, I don’t mind saying that I was a devoted fan of Captain Kangaroo as a child, and Mr. Green Jeans was one of the reasons. Before the Captain, Green Jeans (Hugh Brannum) had recorded a set of radio stories about Little Orley, beginning in 1946. (Lest readers get too driven by nostalgia, I wasn’t around for the original broadcasts.) In the small town of Franklin, Pennsylvania, across the state from where Brannum died, our library had a record of some of the episodes from his radio show. As a child I listened to these tales so much that I still have parts of them memorized to the word. The web brought Little Orley back to me, and now anyone can purchase the tales that I had gone for decades without hearing. Driving through eastern Pennsylvania on an emotionally laden journey, Uncle Lumpy seemed the perfect fare. A few facets of the program struck me anew. Little Orley stories, for those unfortunate enough never to have heard them, are tall tales about a farm boy that involve all manner of hypostatized natural phenomena. Animals, plants, the moon, clouds, and even pancakes talk and act like humans. Or gods. Orley encounters these all with no hint of surprise, and yet goes to church on Sunday and Wednesday night for prayer meeting. The God in these stories is anything but a jealous deity, sharing the stage with a king of the oceans, lakes and seas that can transform a person to a fish, or with mysterious voices that can make a boy a worm and a worm a boy. Leprechauns gambol through the woods, and snowmen amble about trying to help with farm chores. Stories like these in the Bible are now considered factual, right Balaam? In the 1940s they were standard fantasy for children. Now we’ve come to an era of biblical literalism that fears and despises challenges to the single God of sacred writ. In Little Orley, however, a message of tolerance (with some notably politically incorrect caricatures) predominates. Orley is time and again in situations where those who are different should be, and inevitably are, treated as equals. Even God gets some help from talking bats who ring the bell to bring the faithful to church when the sexton breaks the bell-rope. Change, I know, is inevitable. As these miles disappear behind me, I can feel it keeping pace, eventually to eclipse me. Progress is good, but sometimes the way ahead is best found by looking back in wonder. Reality seems more and more intangible all the time. Perhaps this is because I can remember a time, not so long ago, when sitting in front of a computer all day would have been unthinkable. Or maybe it is because when I stepped outside to go for a jog, I found a piece of yesterday’s mail lying on the front lawn. Not that it was terribly important, but it was a stamped piece of mail with my name on it. Soaked with dew. Unread. To err is human, so I wouldn’t have worried about it so much if it hadn’t have happened before. In my days of unemployment, I could hear the postal carrier come onto the stoop, talking away on a cell phone, negotiating the mailbox as if it were a nuisance. Then one day I found a bill that I had put out to be delivered on the sidewalk. The landlord once called, wondering where the rent was. We’d mailed it a week ago, but to this day, years later, it never arrived. I know I’m old fashioned, but a stamp used to mean something. As a child I was a half-hearted philatelist. At the local hobby store you could buy photo-album knock-offs specifically for stamp collecting. Stamps were a promise from the government. I always considered the fact that they were engraved—like dollar bills and liquor bottle labels—to mean that they were serious. There was more than an implied contract here. A stamp meant delivery. Long I would linger over the empty spaces of my stamp album preprinted with the images of the missing stamps. I thrilled to find one of the Grange, although I had no idea what a Grange was. The one with the legend of Sleepy Hollow I coveted with all my youthful imagination: Ichabod Crane being forever chased by the headless horseman. 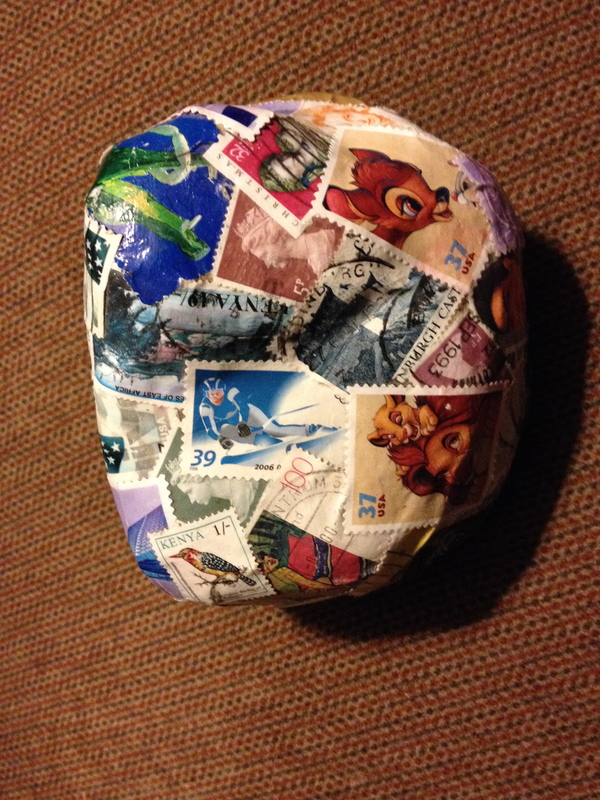 Stamps from other parts of the world were virtually unknown in my small town. When they came, it was like visiting an exotic location in our own living room. A few years back I noticed that stamps were no longer engraved. Printed on a printer not so different from the one that sits on my desk, they have lost their souls. Although their costs have continued to rise, they no longer guarantee delivery like they used to. There was a covenant involved. You licked the stamp, putting it in intimate contact with your body, and the government would ensure the recipient would receive it. I’m outside holding a soggy postcard with my name on it. This one made it to within just yards of its goal before falling, unnoticed from the hand or bag of a mail carrier. We all use email anyway, don’t we? I remember a day as a college sophomore when I had never sat before a computer screen. The world was right there in front of me, inescapably real. Something has happened since then, but I have to admit that I don’t miss licking stamps. I just wonder if reality has really changed. “Jacob have I loved, but Esau have I hated,” at least according to the recollection of Paul in Romans. One of the most poignant scenes in the Hebrew Bible is the story of Esau. Born as the elder brother, in ancient times one could expect certain privileges. Yes, Esau sold his birthright to his brother over a rumbling stomach, but he still knew that the blessing—the true gift—was still his. That, however, Jacob took from him by deception. Isaac, their aged father, was blind but wanted to bless his firstborn before he died. While Esau was out hunting, Jacob slipped in, in disguise, and stole the blessing before fleeing to Iraq. In Genesis 27, Esau came in as instructed only to find the blessing gone. His weeping has never ceased through the ages as his father blessed him with a sword. Years later, Jacob returned to find his brother a wealthy and powerful man. A man who forgave and forgot. But Paul remembered. Hate is a strong word. As a child the worst punishment I can recall came from saying that I hated someone. That word was worse than a swear. Hatred was not worthy of a loving god. Like Esau, however, we don’t stay young forever. By our sword we make our living. For some of us that sword was the written word that we were told was sacred. The image of big, hairy Esau weeping before his blind father disturbed me. He’d done nothing wrong. In fact, he was simply doing what his father asked him to do when his brother snuck in and took something that my young mind couldn’t even parse out from the birthright earlier bargained. Clearly, however, it was important. Upon returning home six chapters later, Jacob fears Esau’s righteous wrath. He knows his brother has legitimate cause to hate him. 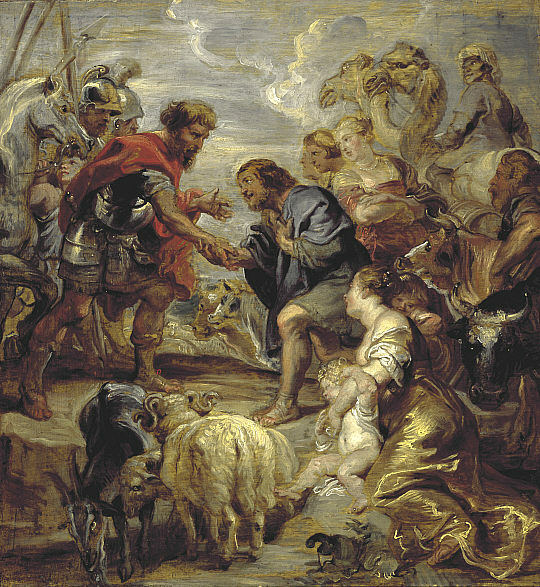 Esau, however, aware that he has enough, welcomes the prodigal home with open arms. There is enough to go around. Even today, with the will to do so, the hatred could be removed. This is a metaphor, not literalism. Genesis is, after all, not history. Stories, however, can convey what facts cannot. Millennia have passed and myths have come and gone. In the simple, if primitive justice of my childhood, you dare not say you hate your brother. Having grown up with brothers I learned that despite conflicts that inevitably arise, hatred is never the answer. Esau forgave, according to Genesis 33. And the land was wide enough for all. 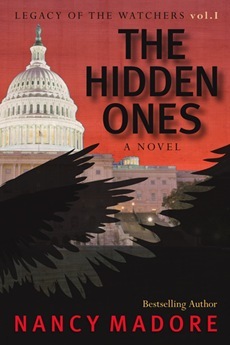 Angels, demons, djinn, watchers, giants, and a healthy dose of fantasy pervade Nancy Madore’s novel, The Hidden Ones. In this present world where, I’m told, the supernatural is irrelevant, it is pleasant to come across a work of fiction that delves so deeply into the pagan roots of Judaism, Christianity, and Islam. Monotheism does have its own skeletons in its capacious closets. Madore is a novelist who insists on prying open those doors long shut, and spinning a tale that involves first responders, shady military officers, and a band of rather hapless archaeologists. And Lilith. Throughout the story Madore comes up with clever etiologies for stories that will appear in canonical form much later, and at one point I couldn’t help wondering if the screen writers of Noah had read her book. Well, actually, The Hidden Ones is the first of a trilogy, Legacy of the Watchers. I’m sure the next two books will contain many surprises as well. The Hidden Ones put me in mind of Michael Heiser’s novel, The Facade. Both take on the mythology of the Nephilim, the fallen ones about which the Bible tells us enough only to leave us hungry. The early chapters of Genesis are like that. There’s so much going on that those of us reading it many centuries after it was written are left wondering what the full story was. The writers of the Bible had no compunction to disbelieve in monsters and beings beyond the human ken. Nor does the Bible attempt to systematize them in any sustained way. These creatures just are. As the old saying goes, however, fiction has to make sense—those who write with gods and angels have to make them fit into a system. No doubt, the uncanny occasionally intrudes upon our rational world. The Hidden Ones presents one such intrusion that, ironically, takes some of the fact of the Bible while leaving the theology suspect. We know that even before the Hebrew Bible was complete ancient scribes were attempting similar things. The book Jubilees, for example, tries to fill in some of the unanswered questions of Genesis, including the watchers and details of the flood. Jubilees, however, never made it into the Bible thus depriving canonical status to the backstory that demonstrates how religion often chooses for ambiguity, leaving it to theologians to bring it all into a system. And novelists. And among those novels that tread where even J, E, P, and D quail, is The Hidden Ones. That feeling is in the air. Autumn began to stretch its melancholy fingers into August this year. Even before the month was half over the mornings had that chill in them that sparked the trees to begin their slow process of shutting down for the winter. Not wanting to admit that it was time to send my daughter back to college, I resisted what is one of the most compelling senses of self-abnegation that can be known—fall, in all its glory. When I saw a blog post on the Salem Witch Trials, I knew I wasn’t alone. The nights are already longer, and that sunset over summer’s beach comes earlier each day. Salem has a way of bringing that home to me. Innocent people murdered for fictitious crimes. Much of the fear that led to this miscarriage of justice was, of course, inspired by religion. The colonials had a great fear of new religious movements. Although it is difficult to believe, Baptists were such a new religion at the time. Considering how Baptist sensibilities now drive much of the Religious Right, it is difficult to imagine that once upon a time, being a Baptist could lead to accusations of being a witch. As much as the Religious Right likes to make claims to a primitivism that is completely fiction (Christianity has always been this way), we have lost touch with what it meant to be a Christian in early America. States (still colonies) had their religious preferences, some even established. If you were a Baptist you’d be most comfortable in Rhode Island. If you leaned Quaker, Pennsylvania was for you. When these disparate colonies banded together into a country, it was quickly realized that religious freedom was the only way for them to work together. The government, the state, could not determine matters of individual conscience. Until, that is, that we could declare that the views of particular individuals on birth control—as informed by their religious authorities—could legally deny their employees full health benefits. Oyer and Terminer, anyone? Freedom is a beautiful idea. It is a concept that only works, however, if it is shared equally. When one faction claims liberty for itself while limiting it for others, we’ve fallen back into times when the Baptist at your door was more dangerous than the Devil in his Hell. And so we revise our history and make claims that America was founded as a Christian nation. Evidence can be ignored, or, failing that, revised. Nothing is written in stone. 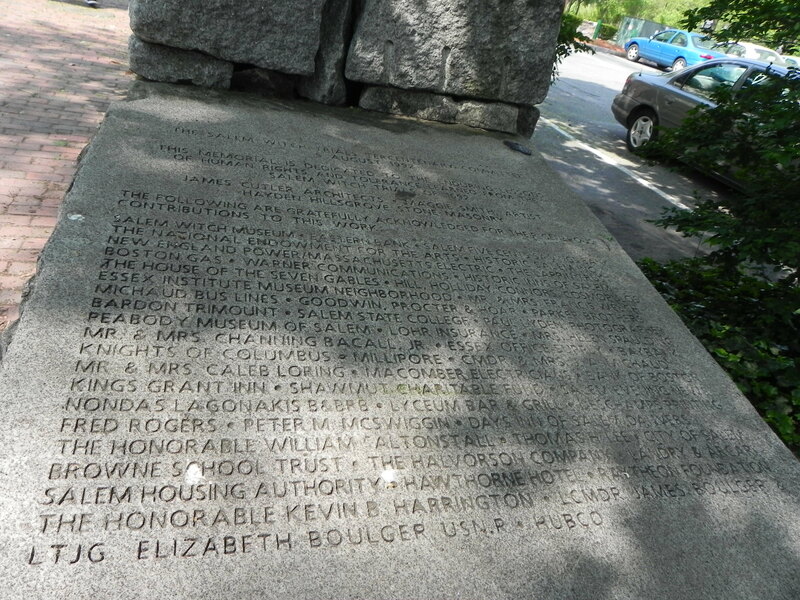 When you visit Salem, there is a quiet little park, off the beaten path. Under some weary old trees are a set of stone benches against a stone wall. On each of the benches are engraved the names of those executed for being imaginary monsters. The leaves on those trees are, I’m sure, beginning to turn. Soon they will silently fall, and only those who are made of stone will deny that autumn is upon us again. If anyone’s premature death has been announced more than Mark Twain’s, it is that of higher education. 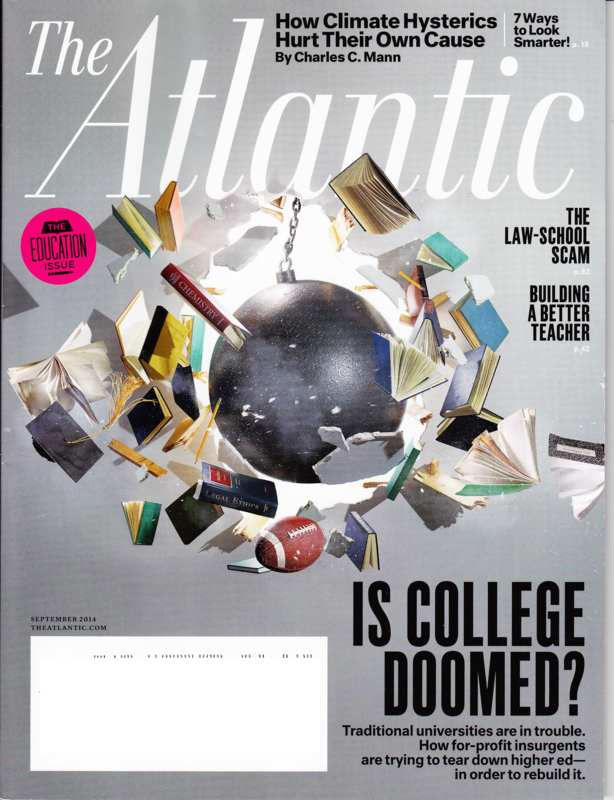 September’s The Atlantic arrived in my mailbox proclaiming itself the “Education Issue” leading with an article “Is College Doomed?” While I appreciate the headiness of Atlantic articles, they run long and my time runs in the opposite direction. I have to read selectively. Things like paying bills and work vie for my time as well. I flipped it open to the article actually entitled “The Future of College?” by Graeme Wood. Four words in, and I froze. The fourth word is “entrepreneur.” Don’t get me wrong; I’m open-minded. Having seen higher education showing its teeth and claws, I know it isn’t the nice pet that the dean will tell you that it is. Nevertheless, from my viewpoint, the main problem higher education is experiencing right now is entrepreneurial in character. Perhaps it’s old school to say, “if it ain’t broke, don’t fix it,” but it is perhaps the most apt phrase to apply to colleges and universities prior to the twenty-first century. And, in my humble opinion, today, while some vestiges can be salvaged. Oh, I know I’m a dinosaur. I literally finished my formal higher education last century. Still, the experience worked well enough. I can’t express, even with daily posts on this little blog, how much I learned sitting through bachelors, masters, and doctoral programs. None of the institutions I attended was perfect (although Edinburgh came pretty close), but they were largely faculty led, and they all recognized that their primary function was to educate, not to prep for entrepreneurial enterprises. There were business schools for that. You couldn’t learn dead languages in business schools. Or even great ideas beyond those with an economic twist. What hath Nietzsche to do with supply-chain optimization? Oh yes, the death of God. My mistake. In my younger years, I had no preconceived notion about higher education. My high school teachers and the clergy in my life encouraged me to go to college, despite the fact that nobody in my family ever had. Even though it was only Grove City College, as soon as I got over the homesickness, I realized I was home. Higher education—my assumptions were challenged. I had to learn to weigh the evidence. By the time I was finished, I had learned to create content as well. And then I started to hear that higher education had one purpose only—to prepare the young for the job market. A place that is too often unthinking and uninspiring. We aren’t educating, we are teaching conformity. And those who don’t have jobs don’t have healthcare coverage. Survival of the fittest. Entrepreneurs by definition. A quarter of a century ago I didn’t even know that higher education was sick, let alone dying. When the future begins with entrepreneurs, however, I’m going to side with Mark Twain, even if he is really dead.